Go outside and play with your toys. 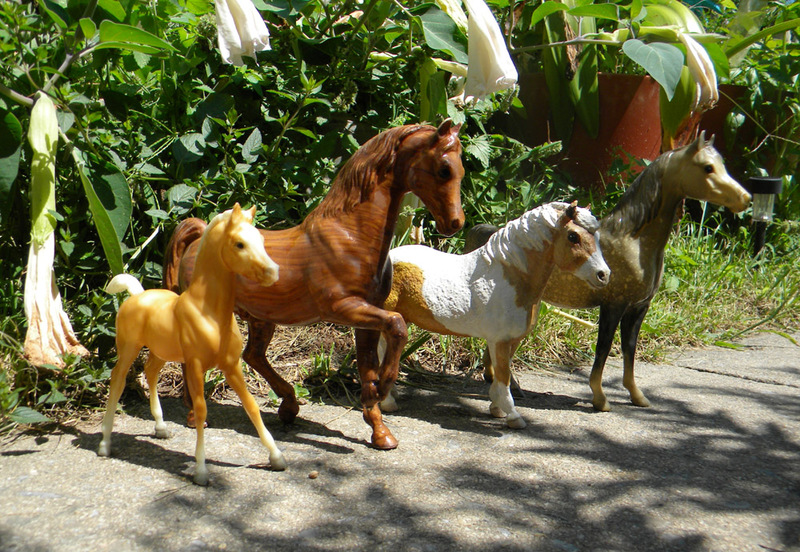 There's a collection of collectors who do some awesome photography using Breyer and other equine models. Photographing model horses in a landscape makes you look at a familiar place in a new way, interact with a new place in a unique way, and celebrate the artistry of the sculpture that is the model. Also, if you don't have a real horse, this is the next best thing. Found in a thrift shop badly faded and yellowed without his tack. I repainted him to the actual white horse the Lone Ranger's Silver is supposed to be (the toy was originally designed as a light grey). He's fairly posable and fun to photograph. Another nice "Barbie scale" horse, somewhat poseable. He's actually a palomino (light mane and tail not dark like a buckskin). This is his original paint job. The Johnny West horses were designed by artists who actually knew what horses look like. They echo the type of horse drawn by Charles Russell and Frederick Remington. Hartland made some nice (if simpler than Breyers) models back in the 60s. This is the Arabian stallion in what they called "alabaster" (near-white grey with a grey mane and tail). The action figure is Legolas from the LOTR collection by Toybiz. Arabian foal, Arabian Stallion (rare woodgrain), Misty of Chincoteague (bought at her gift shop by her stable three months before she died and repainted the correct color pattern), Arabian mare. I got Misty in 1972, the last year the real Misty was alive. She lived at the Pony Farm on Chincoteague and we visited her there. The gift shop had a Breyer model, painted (oddly for Breyer) completely wrong. Well, at least her head. What Breyer had done was copy the excellent cover art by Wesley Dennis (an awesome artist who knows horses and other animals and has done many many Marguerite Henry books). What they didn't know, was he'd painted the cover as Misty in her foal coat, a misty white with her adult palomino color showing around her eyes. To the non-horseman, it looked like a pinto with a white head and a patch around the eye. her real color was palomino pinto, a solid (as in most tobiano patterns) head with a blaze. I repainted her from photos and Wesley Dennis's paintings of her as an adult. 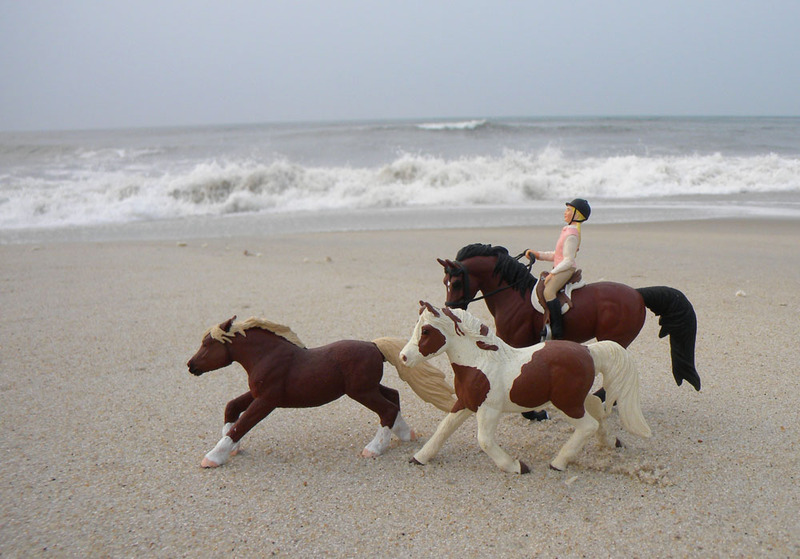 I aquired Stormy a few years later on another trip to Chincoteague. Here they return to their home island. Save your home decor accent-color brainfarts for cheesy Chinese plastic, recycled things found in thrift shops, yard sales and the trash. The larger ones are actually Wonder Horses without their bouncy frames. Their original paint job was awful, their anatomy is great. The mermaid horses are Our Generation: I simply repainted the beat up black one, flat black (with shiny eyes). The battered white one became a blue sea horse (add a ModPodge top layer embedded with glitter for a seawater look). Colors are: Rustoleum 2X Lagoon, Seaside, Oasis and Apple Barrel Craft Paint Turquoise. The low waves of this Chesapeake Bay beach are in better scale to the horse than an ocean beach. Not as detailed as Breyers, these still have a fairly nice shape and reasonably accurate anatomy. Especially nice when repainted, even in basic black. Nice as chalkboard horses, or as resculpt or repaint projects. get on your model's eye level for most shots, or on the eye level of the rider. try other eye levels: high, low. Set your camera on a beanbag to keep it steady. it is sometimes hard to get the whole thing in focus: small models are sharp and backgrounds are fuzzy, or backgrounds are sharp and the model is out of focus. Put the camera on a tripod and take a shot focused on the background, and one focused on the model. beware, water has scale (which is how we know that famous photo of the Loch Ness Monster is fake: the lake ripples point out that the model is about three feet tall). Gloppy water that looks like Jello and great big drops of water will show your model to be four inches tall. Play with spray bottles, foamy surf, or other ways to make the water look in scale. Use bigger models and keep the little ones in still water or keep the water in the background. keep the ground under the horse's feet in scale: use finer sand/gravel/tanbark, cut that grass, shoot your horse among tiny flowers. if you are using action figures or articulated dolls, use clothing to hide the joints or Photoshop them out later. Makes it look more real. where is your sun? your shadow? don't leave your own footprints in that snow or sand! make a set: a classic bit of film FX is to make a model, (like a building) and shoot it up close while normal sized things are far away (including people walking in the background). Your horse can be set on a piece of board covered with fake ground or grass, a fence to the horse's scale, and normal landscapes and buildings can be in the background and look great. don't forget to add your horse's footprints!